AP Photo Minnesota Vikings wide receiver Cordarrelle Patterson (84) is stopped by Jacksonville Jaguars middle linebacker Paul Posluszny (51) and cornerback Aaron Colvin (22) after a reception during the second half of an NFL football game, Sunday, in Jacksonville, Fla.
JACKSONVILLE, Fla. (AP) — The Minnesota Vikings feel as if they’re back in the playoff picture. The Jacksonville Jaguars seem to be counting down the days until the season is over. 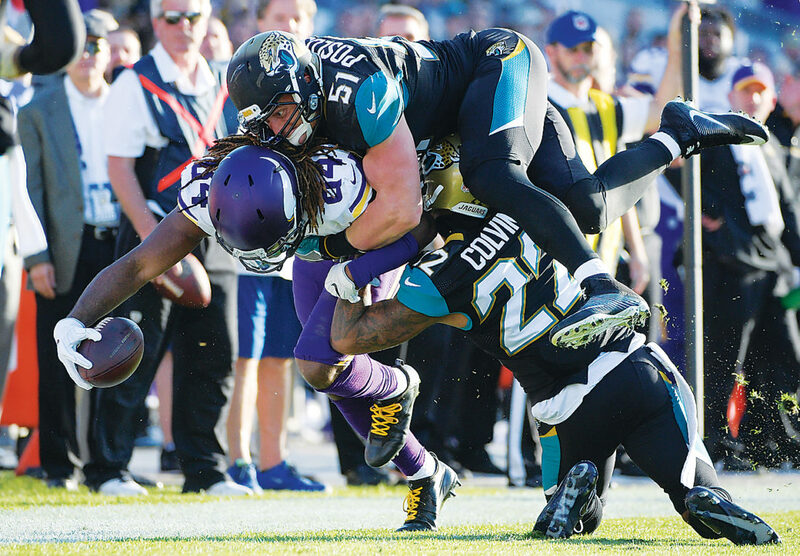 Although both teams looked mostly lost the past two months, the Vikings used a trip to Jacksonville to gain some much-needed confidence and maybe even turn around a season that went awry after a 5-0 start. Matt Asiata scored on a short touchdown run, Kai Forbath kicked four field goals and the Vikings beat the hapless Jacksonville Jaguars 25-16 on Sunday, winning for just the second time in nine weeks. Sam Bradford completed 24 of 34 passes for 292 yards and a touchdown. He wasn’t sacked and scrambled four times for 17 yards. His 3-yard TD toss to tight end Kyle Rudolph with 2:13 remaining sealed the victory. Minnesota (7-6) hadn’t won on the road since Sept. 25 at Carolina and needed a victory to keep pace in the NFC playoff race. With games against Indianapolis, Green Bay and Chicago remaining, the Vikings believe they can win out and slide in. Little went Minnesota’s way Sunday, but it didn’t matter. The Vikings lost the turnover battle, failed to score twice inside the 1-yard line , allowed a fourth-down conversion on a fake punt and missed an extra point. Those kinds of mistakes normally would result in a loss, especially on the road. Not against the Jaguars (2-11), who dropped their record-tying eighth consecutive game and fell to 0-6 at EverBank Field this season. Jacksonville now needs to win at Houston next week to avoid setting the single-season franchise record with nine straight losses. The club mark is 13 consecutive losses over two seasons. “It’s tough anytime you lose,” quarterback Blake Bortles said. “I know for me personally, I can’t wait to play on Sunday the following week and get another opportunity and hopefully to try to erase some of this stuff that’s going on and maybe wake up from this nightmare. Known more for short passes than deep shots, the Vikings changed things up against the Jaguars. Bradford connected with Rudolph for 44 yards on the first play from scrimmage and then found Thielen for a 41-yard gain on Minnesota’s second possession. Both set up field goals. He also found Diggs for a diving, 45-yarder in the first half. “We created some explosive plays, and anytime you do that, it just makes it easier for the offense,” Bradford said. Marqise Lee caught five passes for a career-high 113 yards, further establishing himself as Jacksonville’s go-to guy down the stretch. Allen Robinson finished with one reception for 17 yards, giving him nine catches for 90 yards in the past four games. Robinson, Bortles and offensive coordinator Nate Hackett held a private meeting this week in hopes of “getting on the same page,” but it was another dismal day for the 2015 Pro Bowl receiver. Lee, meanwhile, had another strong showing . Vikings coach Mike Zimmer had no real issues in his first game back following eye surgery. Zimmer missed last week’s game against Dallas because of a detached retina and was unsure earlier in the week whether he would be on the field or in an upstairs box. Zimmer, who needed a doctor’s clearance to fly to Jacksonville, wore a patch over his right eye and had no limitations. “I couldn’t see to my right, but other than that, not really,” he said.